bounce off the rail tracks onto the juggy rib on your left and gain the arete which leads to a chunky auburn thread. Step right and stretch for the dogleg crack which leads (awkwardly) up rightwards to the convenient Chitra lower-off. Taken Over By Department C F7a. Re-bolted. 03/07. Nik-Arete F6b+. New Route. 25/03/07. Slab and arete left of Cig-Arete. Waiting on an Angel E1 5b. The obvious groove left by massive rockfall left of Cig-arete. one bolt and a few small wires. 03/07. Cig-Arete F7b. New bolts one added to stop a ground fall after a rockfall raised the level of the floor and lower off. 09/06. Follow Where are my Sensible Shoes to the break by the final bolt. Surmount the stupendous summit headwall direct via a hold. Gwion’s Groove F6a. clip 1st bolt on Sensible Shoes and follow the bolts into drowning man. 3/07. F.A: Mark Dicken, Sam Dicken. Bold but easy climbing up the slab to the right of the crack leads to a flake on the arete. Step back right and move up to the obvious layback feature. A heart in you mouth move up this lead to the first and only bolt on the route, ironically after you have done the crux. Carry onto to the top. a previous guidebook mistake. Could probably do with a lower off, as its good, but getting down isn’t. The obvious and intincing crack line to the left of Concorde Dawn. Climb the sustained and technical crack until you can move out right to climb easier ground past two bolts. A desperate start leads to more desperate climbign to reach and pass the first break. It doesn’t get any easier until a desperate finale to reach a hold on the right side of the nose. NB the bolts are already corroded as the hangers are stainless and the bolts are steel! Climb the middle of the steep dolerite wall to the left of Honorary Limestone on massive jugs to gain a crack. Follow this briefly to a peg and move up past pockets to another large break. Carry on up past a small thread and peg. Step right into the lower off on Honorary Limestone. Monster Munch F6c+ * 12m Climbs the thin seam between Circus Skills and White Tiger. Short but continuously interesting with a thin crux at the top, for the full tick finish direct on thin crimps and smears. White Tiger F6a * 14m. Climbs the 2nd thin seam on the ‘Plateau Slab’ 5 bolts lead the way to a lower off. Celtic Warrior F6a *14m. 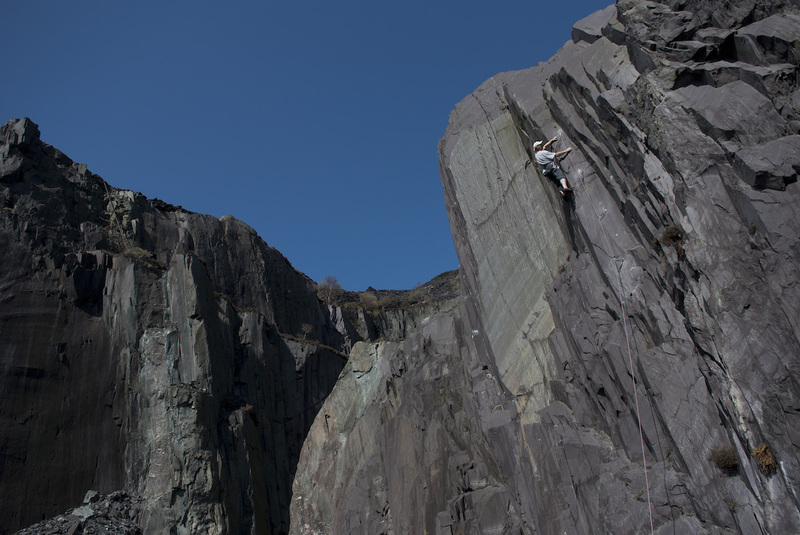 Climbs the next line of weakness to the right of Slate Ninja on the ‘Plateau Slab’, 5 bolts to a lower off. Magic Carpet F5 14m Follow the obvious line of weakness to the right of Celtic Warrior, 5 bolts to a lower off. Teenage Dreams F6b **18m Climbs to the highest point on the ‘Plateau Slab’ start to the right of Magic Carpet on the far right hand side of the slab. Some nice moves in the centre of the slab with an easier finish. Lower off bolts on the final pinnacle. Pick & Mix 6a 40m Start at the bottom left handside of Plateau Slab. Climb the first 3 bolts of ‘Circus Skills’, then fire up diagonally right until you reach the highest point of the slab and lower-off of ‘Carp Diem’ & ‘Teenage Dreams’. Take plenty of quickdraws. Abseil off. Climbs the obvious large crack a few meters right of ‘Come Inside’. A unnerving start past a large dangerous block (well tested) gives access to a brilliant jamming and lay-backing up the top hand crack.